This fly is the number one in my fly box. There is rarely a days fishing goes by without this little beauty being on my leader. It is easy to tie and uses the bare minimum of materials. The very basic fly can be tied using only a hook, black tying thread and silver wire with a couple of coats of clear varnish. You can paint on fluorescent orange wing buds on the thorax, or tie in orange floss strips instead, you can tie in fluorescent red or green tying thread at the tail . All small trigger points designed to catch the eye of the trout. The other colours you can tie, and all have their day, are as follows. Olive, red , orange and brown. 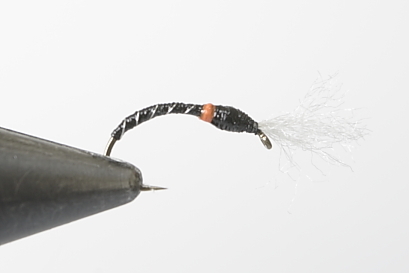 There is also a slimmed down version known as the skinny buzzer usually in black or brown. Hook Buzzer 10, 12, 14. (Kamasan B100 for skinny and Roydlures for heavy. Hi I’ve not been flyfishing for that long and have got bored with wasting my money on buying flies and have decided to start making my own thanks to your inspiration. I am a novice and just bought my first fly tying kit 4 hours ago. The sale person had given me my first lesson in fly tying but I cannot remember all the steps. I went to the internet immediately to get help and almost paid US$150 for a basic fly tying video from the US ! Luckily I found your video in youtube. You make fly tying so simple and I am instantly hooked ! The step-by-step video is very simple to understand, every steps is very easy to follow. You have shown us that fly tying is inexpensive and it is about creativity and the use of ready available materials. I thank you sincerely from the bottom of my heart. All the best to you and I hope to learn many more lessons from you, sir. Thanks for your e-mail. Glad we could be of help. We have tried to keep the lessons simple but if you need any further help just email. I just got outfitted with fly tying equipment along with a Fly Tying Instruction booklet. I could not figure from the book how to start the thread so went to the web for help and found your site. Lesson one was very easy to follow. I like the way the lesson is presented -narration clear and photography sharp. I’ve marked your sight in my favorites and plan to go through each lesson. In the UK we refer to buzzers as imitations of the midge pupae which spend most of their life in the mud at the bottom of lake or river before hatching out as mature flies. It is in the transition period when they ascend to the water surface that they become buzzers. The colours of the body can be black, red orange,olive or green in various sizes from 14 to 10s. Thanks for your comments. I only wish I could be with you for the start of your season. We will try to come up with some mayflies in time. We are only restricted in the amount of time my son Jon can afford as he has a business to run and has little spare time. Hello Mr Cammiss (and team). Thank you very much for your site. I’m a beginner in fly tying and you are from now on my master. Your story about your own begening experience is so nice and helpful to understand your huge generosity. I´m from Chile and we have a very good fishing sites around here. I`m fly fishing since 2000 and tying just from one month. Could you publish some dry flies tying lessons please? Hatches are very commons in my area and caddis, mayflies, adams, and others are very effective. I´ll be very appreciated if you teach us how to ty those patterns, specially mayflies. Thank you and your boys again. My best regards from Chile, were the fishing season starts TODAY!!!. What is its name in the US? Thanks a lot for this first lesson. It’s the first I’ve watched, since I only discovered your website a few minutes ago. Bravo: clear and simple, perfect for beginners. I’ve been tying my own flies for 3 years now, but it was worth watching anyway: I’ve discovered a new way to make the final knot : actually, I’ve learned only to make a whip finish and at times it’s not quite convenient. first rate, cuts through the modern “speak” towards fly tying. Good clear instructions. Have just started fly fishing/fly tying after 20 years(raising a family has a lot to answer for !) your enthusiasm is clear. tight lines all. I have just tied my very first flies using Lesson 1….and i’m very pleased with the result…all thanks to you…I/m now totally hooked (no pun…)…i’m especially pleased with the half Hitch that you demonstrated…got the hang of it after the first attempt!! !…now all I need is to learn the whip finish…any chance of a demo? Just wanted to say thank you…. Great Video..I have recently just bought a starter fly tying kit but before i can try the buzzer i need to get some varnish …can u use clear nail varnish? …. Hi just getting back into fly fishing and tying after 17 years, good vidio and refresher for me I hope you do many more. I started watching your videos around a week ago and they were an inspiration to me. My first attempt left a bit to be desired and I couldn’t imagine any fish taking it unless it were blind. Since then I’ve practised and managed to tie myself a Diawl Bach last night. My only problem now is tying off. You do it so quickly and expertly that I had to freeze the video several times and still don’t know if I’m doing it correctly. I end up with the fly tied and the thread doesn’t come undone but I have a few little knots in the thread. When the fly is varnished it is fine. Seeing as the thread still remains unwound after tying off, is this ok? At last, a clear, unhurried approach to fly tying lessons. I look forward to seeing even more techniques and materials. Thanks very much Dave Cammiss!